Banjarmasin, 8 September 2014 - The Aston Banua Hotel & Convention Center, a modern international standard four-star hotel, is recently opened and bring high end accommodations geared to the needs of business travelers and the region’s largest conference facilities to South Kalimantan. The new hotel, which is the 39th Aston hotel in Indonesia, sits in a strategic location on Jalan Jendral Ahmad Yani right next to the Grand Banua Superblock lifestyle entertainment complex, half way in-between Syamsudin Noor Airport and the Banjarmasin’s city center. Featuring 206 rooms and suites as well as a restaurant and lounge, swimming pool, spa, and fitness center and with seven meeting rooms and a convention hall for up to 2.000 persons the principal convention center in the region the hotel is set to become the foremost regional venue for meetings and exhibitions. The capital city of South Kalimantan province, Banjarmasin is located on a delta island near the junction of the Barito and Martapura rivers and is often called the "River City." Banjarmasin is famous for its floating marketplace, where buyers and sellers trade using boats, on the western outskirts of the city. Banjarmasin is also well known as a center for trading gemstones, especially diamonds and rubies. “We are very excited to expand our Aston brand to South Kalimantan. After our previous successes in Kalimantan, including our properties in Pontianak, Balikpapan, Samarinda, Ketapang, and Tanjung, I am confident that the Aston Banua will quickly become the preferred four-star hotel in Banjarmasin for business and social travel. We also look forward to opening Aston and favehotel properties in Banjarbaru in the coming months,” says John Flood, President and CEO of Archipelago International. 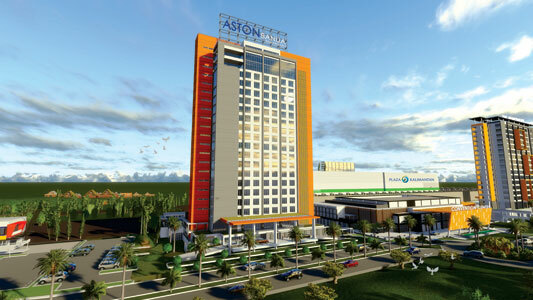 Exterior of Aston Banua Hotel & Convention Center - Banjarmasin. 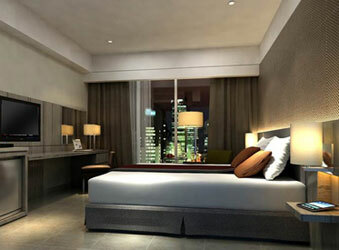 Interior - Deluxe Room of Aston Banua Hotel & Convention Center - Banjarmasin. 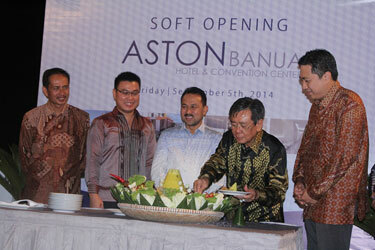 Soft Opening of Aston Banua Hotel & Convention Center Ceremony - Seen in the picture from left to right Bapak DR. DRS. Suhardjo, Msi - Represented for Governor of South Kalimantan, Bapak. Edward Sarjono - Managing Director of PT. Banua Megah Sejahtera, Bapak. Sultan Haji Khairul Saleh - Regents of Banjar City, Bapak. Kusno Harjianto - President Commissioner of PT. Banua Megah Sejahtera, Bapak. Sadeli Setiawan - Commissioner of PT. Banua Megah Sejahtera at the soft opening ceremony event.